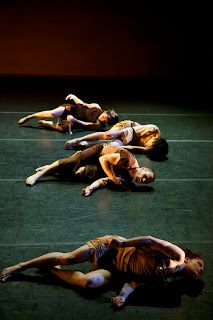 "ODD", the recent collaboration between Axis Dance Company and inkBoat played to a packed house at Oakland's Malonga Theater last Friday night. Obviously the result of intense examination and development, the entire work existed in a strange 'in between' place, serving up a main course of distortion with a side of integration. The formal aspects of the piece really 'made' the dance: the unique take on interdisciplinary performance and the choreographic study of physicality. Unfortunately, the overuse of distortion in "ODD" led to an entire hour and a half that stayed on one level. The structural nuggets had such enormous potential but the finished product did not allow them to be fully realized. Interdisciplinary performance works that combine the different contemporary arts are super trendy right now, and usually done poorly. But, "ODD" demonstrated a better way to look at and think about connection and integration. Director and choreographer Shinichi Iova-Koga opted to have the artistic collaborations happen live and in real time - the cellist who had composed the score, a soundscape artist adding additional elements to the music, a painter who transformed blank canvases and dancers who moved and spoke text. The physical set-up also forced the audience to be responsible and culpable for what they were seeing. The musicians were far stage right, the dancers mostly in the center and the painter downstage left. We had to choose how to view the piece and determine what aspect drew the attention at any given moment. I generally think that interdisciplinary projects tend toward 'too much', but this was incredibly cohesive and brilliantly orchestrated. The process of human movement was equally compelling. Primitive organisms were apparent as dancers inched their way across the stage like worms and crawled with the co-ordinating (same arm as leg) motion of salamanders. In addition, the body's transitory movement from one state to another was highlighted. As the performers slowly passed through a plethora of in between positions, we saw an emphasized representation of the small reflexive motions that each body experiences. It is difficult to notice these tiny adjustments in yourself, but pausing television is an easy way to see what is really happening in the body's muscles as they move. The bizarre facial expressions that you sometimes capture are examples of these fleeting moments. Attention to the enunciation of the body was obvious even as the dancers walked towards us. You could see each metatarsal as every toe separated and articulated - extraordinary, intentional and almost sensuous. Though I clearly found Iova-Koga's concepts and choreography intriguing, everything was overshadowed by a huge cloud of distortion, and not in a good way. Violence, hostility and neurosis were the name of the game, epitomized through the grotesque: gnarled hands, body twitches, spastic sissones, bourées attempted with turned-in, locked knees. The overwhelming facial distortions were reminiscent of Butoh, and although they make sense in Butoh, here they didn't really fit (especially not to the extent they were used). This wasn't a Butoh performance, period. Not only did the distortion pull focus, but it also concealed the 'positives' in the piece: the interdisciplinary interactions and the physicality itself. There is definitely value in exposing audiences to all kinds of movement, though, emphasizing one idea too much always runs the risk losing its impact. Instead of being challenging and unexpected, "ODD" became monotonous and a little boring.